Gareth Southgate has called up Michael Keane into the England squad ahead of Albion defender Lewis Dunk. Dunk had been tipped for a call-up by many pundits for his form this season but was over-looked for the original 25-man squad last week. Dele Alli withdrew from the squad with a hamstring injury at the weekend and Southgate has now called up Everton centre-back Keane as his replacement. Dunk has helped Brighton keep four clean sheets in the Premier League this season and the Seagulls have conceded just 11 goals in 11 games as they sit eighth in the top flight. Keane has had a mixed start to his Everton career, after joining from Burnley in the summer, and the Toffees have conceded 25 goals in 16 matches in which the 24-year-old has played. 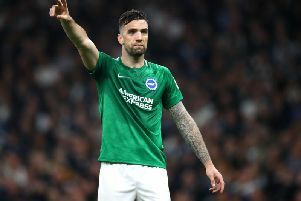 Brighton defender Shane Duffy felt Dunk deserved to be named in the England squad and said: "I was a bit surprised he didn't get called up to this squad. I thought he'd been performing well enough to get involved. "His time will come, he's good enough and the more he plays and keeps performing as he does, it will just be a matter of time." Harry Kane and Harry Winks – who were both substituted during Tottenham's 1-0 win against Crystal Palace yesterday - will undergo further assessment at their club before joining up with England, as will Chelsea's Gary Cahill.